MARLBOROUGH, Mass. – Marlborough’s dominant defense and relentless rushing attack propelled the Panthers past Nashoba 27-7 Friday night, in a battle for the top spot in both Division 2A Central, and Mid-Wach B. The offense and defense both received notable contributions from senior Owen Cappadona, who rushed for 101 yards and a touchdown to go along with two tackles for a loss on defense. Marlborough head coach Sean Mahoney was very complimentary of Owen’s play after the game. “Owen is an excellent player both ways. He makes big plays for us,” Mahoney said of his star senior. The Panthers (4-2, 3-0 Mid-Wach B) wasted no time putting points on the board. After forcing the Chieftains (3-3, 2-2 Mid-Wach B) to punt after four plays from scrimmage, Marlborough moved methodically down the field. Runs by Cappadona of 30 yards, 11 yards, and 6 yards set up Marlborough with first-and-goal at the Nashoba 9-yard line. Two plays later, senior captain Luke Goulet punched it in from the 1-yard line, the first of three touchdowns Goulet would score on the night. The extra point by Jake Dionne gave Marlborough a 7-0 lead with 4:25 remaining in the first quarter. The two playoff-hopeful squads exchanged punts as the first quarter drew to a close. Nashoba began their first drive of the second quarter on their own 14-yard line. A catch-and-run by Nashoba senior Nate Mansour and a roughing the passer penalty on Marlborough gave Nashoba a first down at the Marlborough 44-yard line. Just four plays later, Cappadona tackled a Chieftain receiver short of the first down marker, and Marlborough took over on downs. On the Panther’s ensuing drive, a 15-yard run down the left sideline by junior Kevin Short and a 17-yard run by Goulet gave Marlborough with a first-and-goal from the Nashoba 5-yard line. Cappadona capped off the drive with a 5-yard touchdown run up the middle. Dionne’s extra point gave Marlborough a 14-0 lead with 5:08 left in the second period. Nashoba’s offense was sparked late in the second quarter by a 27-yard run by Mansour. A nine-yard run by senior Nick Rodgers gave the Chieftains a first down at the Marlborough 8-yard line. Four plays later, Marlborough senior Ryan Shaughnessy sacked Nashoba quarterback Owen Fay, and the Panthers took over on downs as the first half came to a conclusion. Nashoba would come knocking on the door once again in their first offensive possession of the second half. On second-and-18, Fay connected with wide receiver Breese Hill for 28 yards. Five plays later, Rodgers scored from 2 yards out, whittling Nashoba’s deficit to 14-7. Marlborough responded with a touchdown drive of its own, culminating with Goulet’s second touchdown of the day, this one a 3-yard run up the middle. The extra point was no good after a penalty against Marlborough, but the lead was stretched to 20-7. Coach Mahoney was pleased with how his team responded after the Chieftains got on the board. “That was big…. If we had a three-and-out there, it would have been different,” Coach Mahoney said of his team’s third touchdown of the night. Cappadona saved his best defense for the fourth quarter. On fourth-and-nine from the Marlborough 35-yard line, Cappadona sacked a scrambling Fay, and the Chieftains turned the pigskin over on downs. Nashoba’s defense responded with a big play of their own in the fourth quarter. The Chieftains recovered a Marlborough fumble at the Nashoba 9-yard line. After two incomplete passes and a sack by Cappadona, Nashoba was forced to punt from deep within their own territory. Goulet sealed the win with an 11-yard touchdown run, his third score of the night, with 1:31 remaining in the fourth quarter. 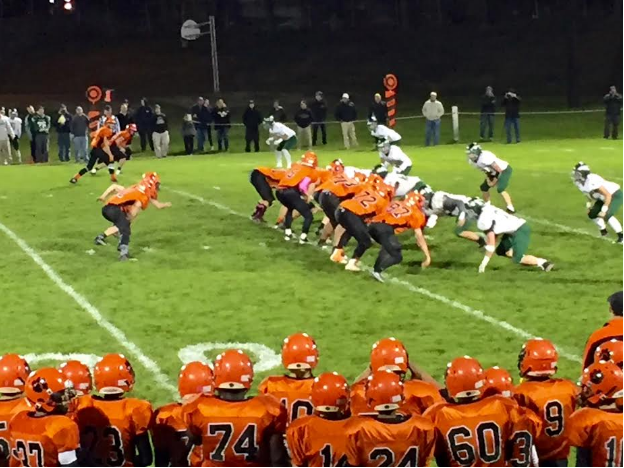 The Panthers recovered a Nashoba fumble with 28 seconds left to officially put the game out of Nashoba’s reach. Although Coach Mahoney is happy with the overall result, he still wants to see his team improve and eliminate mistakes, especially penalties. “We can get better. We had a lot of penalties. We usually don’t have a lot of penalties… We can clean that up,” Coach Mahoney said. With the victory, the Panthers protected the top spot in Mid-Wach B, and they will continue their quest to clinch the top seed in Division 2A Central in next Friday night’s game in Fitchburg. Nashoba will look to keep their playoff hopes alive in their game next Friday night at home against Shepherd Hill.